Hello everyone! 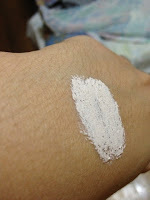 I'm writing this post on a Sunday, right after I had the Clay Mask applied last night :) Who cares anyway when did I use it? Haha! Let's blog away!! If you have large pores then this product is for you. I bought this nearly two months ago from ebay since there's no Innisfree outlet here in the Philippines yet but only got the time to try the Innisfree Jeju Volcanic Pore Clay Mask last night although I use the cleansing foam every other day. That pretty korean girl is Yoona of SNSD/Girl's Generation ^__^ Nice skin, right? So here goes my Review and some directions to help! 2. Pat dry and rest your skin for about 2 to 3 minutes. While resting, prepare your Innisfree Jeju Volcanic Pore Clay Mask. Note: Don't be shocked for it's mud color and off smell. 3. On your clean skin, gently massage the clay mask evenly. Don't include the lips, eyes, eyebrows and hairline. Just focus on the T-zone or the areas with much attention needed. 4. Rest it on your face for about 10 to 15 minutes or until the clay mask has completely dried up. Gently remove the mask with a warm towel then once the mask has been cleared, wash it again, WARM WATER. 6. Upon waking up, wash with warm water. Good enough to start your day! 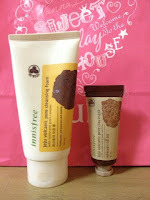 4.8 stars (out of 5) for the Innisfree Jeju Volcanic Pore Clay Mask and Innisfree Jeju Volcanic Pore Clay Cleansing Foam. It feels good to wake up having clear and radiant skin!